In 2012, the El Dorado Airport Land Use Commission adopted a Placerville Airport Land Use Compatibility Plan (ALUCP) for the Placerville Municipal Airport. Full text of the El Dorado Airport Land Use Compatibility Plan can be accessed via the El Dorado County Transportation Commission webpage . Per state statute, local governments with land use authority over lands located with an Influence Area of an airport must amend their general plans to be consistent with an adopted Airport Land Use Compatibility Plan. On June 25, 2013, City Council adopted Resolution 8105 that amended the General Plan Policy Document to include the addition of goals and policies to Section I: Land Use, Section III: Transportation and Section VI: Health and Safety that address specifically the ALUCP and existing and future land use compatibility within the airport proximity. 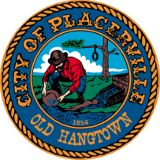 Additional amendments involved the adoption by reference of Chapters 2, 3, 4, 6 and 9 of the Placerville ALUCP, which contain land use compatibility policies. On July 9, 2013, City Council adopted Ordinance 1655 which established the AO, Airport Overlay Zone. The purpose of the AO zone is to establish the procedure for evaluating the compatibility of new development located within the airport’s Influence Area with the policies within the ALUCP.